We specialize in fine diamonds and you! Holiday hours: Extended Holiday Hours in December. 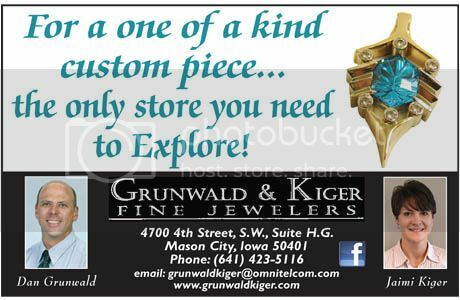 Grunwald & Kiger Fine Jewelers started out in 1991 as Hanson-Grunwald Fine Jewelers. Jaimi Kiger came on staff in 1999 as a goldsmith & designer with ten years of experience. In July 2005 the company became Grunwald & Kiger Fine Jewelers working in the same location. Dan Grunwald has a Bachelor of Fine Arts Degree from St. Cloud University, an accredited Art School in Minnesota. He has been an owner since the store first opened in 1991, and specializes in custom-made jewelry designs. "We do true custom work, not just adding heads to precast mountings," says Dan. "Jaimi and I both do original designs and make jewelry from scratch. That way the customer becomes part of the design process and can take pride in the one of a kind finished product." Dan explains, "We start with the drawing, make a wax model cast, and then complete the finished piece, all in the Mason City store." Both Dan and Jaimi have won numerous design awards and are active with many community events.